An eight-piece progressive band from Scotland, Preacher neatly straddle the divide between old-school progressive rock and contemporary progressive metal, with ‘Aftermath’ sounding like it could have been recorded by Pink Floyd in the Seventies or by Arjen Anthony Lucassen a couple of weeks ago. The cover art screams ‘check me out’, and if you’re tempted – and believe me, you should be – prepare to be entranced by what could be the UK’s best kept secret. So what makes Preacher so special? Well, firstly, with a line-up that features Martin Murphy (vocals/guitar), Greg Murphy (lead guitar), Ron Rodger (acoustic guitar), Arny Burgoyne (keyboards), Gordon Monro (bass), Iain Duncan (drums) and a pair of backing singers in Angela Bell and Kerry McWhinnie the band project a full, rich sound on disc, which makes you go on to wonder just how powerful they must be on stage. Secondly, the songs on offer are all from the top drawer. There’s no fillers, no padding, no waffle; just nigh-on fifty minutes of classy and diverse material, well composed and beautifully executed. (If you want instant evidence, just listen to ‘Vision’, not so much a song as a six-and-a-half minute phenomenon.) And thirdly, the musicians are all at the top of their game. Check out Burgoyne’s keyboard solo in ‘Welcome To The Fray’ or his playful electric piano slot in ‘Vinyl’, or any of Greg Murphy’s guitar work in the nine songs that make up the album (although it’s his solo in ‘Sleep’ that ironically keeps me awake at night at the moment); and even if ‘Hold On’ is personally a tad too lighters-in-the-air for me, it’s redeemed by a most marvellous piece of lead guitar work. Atop that comes the fact that Murphy sounds uncannily like David Bowie at times, giving an added twist to a highly evocative and fabulously entertaining album. 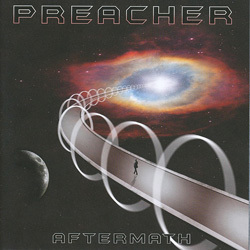 ‘Aftermath’ is Preacher’s second album, following on from ‘Signals’ a couple of years back, and is so upbeat as to be a joyous celebration of not only what’s so immensely exciting about progressive rock/metal, but also of all that’s right with the world. Life doesn’t get much better than this, believe me.